With commuter ferry ridership statistics for two years under their belt, city officials will push for sustained federal money to keep the Lynn-to-Boston boat running and compete for a federal grant to pay for a boat. The Boston Harbor Cruise ferry Cetacea pulled away from the Blossom Street extension dock at 8:03 a.m. Friday, signaling an end to this year’s morning waterborne commutes and the end of a two-year state pilot program supporting the ferry’s operation. The state provided $1.5 million for the ferry operation, which ran back and forth from Lynn to Boston three times a day, and the city Economic Development and Industrial Corporation hired Boston Harbor Cruises to provide a boat and crew. With enthusiastic commuters on their side and support from state legislators, including state Sen. Thomas M. McGee, city officials will seek out money to pay for ferry operations in 2016 and subsequent years. “We are able to go to the feds and say we can prove a demand on the North Shore,” said city EDIC Director James Cowdell. John Roy of Nahant, Rick Rawlings of Swampscott and Anthony Waite of Swampscott, from left, wait on the deck for the Lynn ferry to leave for Boston Friday morning. To make that case, ferry riders like Elisabeth Winer of Marblehead and William Ulmer of Lynn said the Lynn ferry needs more publicity. “The target audience is people who take public transit,” Ulmer said. He said two seasons spent skimming across the water forged a bond between ferry riders, Ulmer said, that kept them dedicated to the ferry. Cowdell is aware of that strong allegiance and said the city has marketed the ferry as a commuting alternative to transit riders. The city faces an Oct. 2 deadline to apply for a federal grant to help pay for a ferry. Cowdell said competition for the money is stiff with $30 million available nationwide and boats costing between $4 million and $5 million. “It all comes down to money. We will chase every available dollar,” he said. 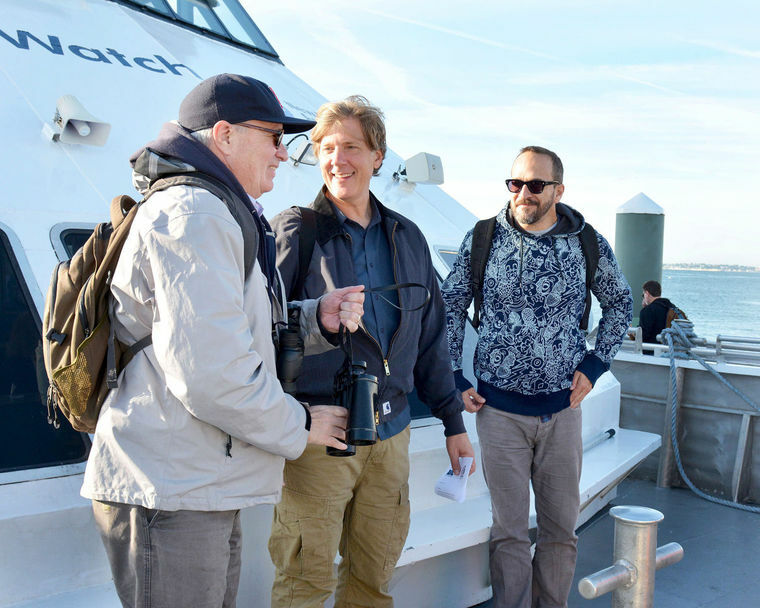 The EDIC and the Cetacea’s crew saluted the end to the ferry season by offering complimentary drinks and snacks on the ferry’s 5:45 p.m. Friday evening trip from Boston. “We’ll see you in the spring,” concluded a letter handed out on Friday to commuters. Swampscott resident Danielle Halderman is convinced a strong advertising campaign aimed at increasing ferry ridership can successfully underscore the assets of a water commute. “It’s convenient and the service and the people are very nice,” Halderman said.